"TATTOO PERT" owner and ‘Head Honcho’ of The Ink Castle. Pert has been tattooing now for almost 40 years and can cater for many styles asked of him. Any nervous customers will soon be put at ease by his friendly, jovial manner. 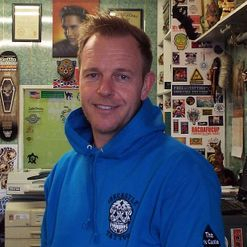 Pert is also a multi award winning artist, and can often be found working at the many tattoo conventions around Britain and Europe. A.P.T.A. - E.T.A.F. - S.T.A.B. - T.C.G.B. "Tattoo Jack" is Pert's son and has been working at the Ink Castle since he left school in 2001. During this time he has learnt the art of tattooing from his father and has been tattooing professionally now for a number of years. Jack is skilled in various styles but particularly enjoys working on bold and bright traditional style designs. Completing the Ink Castle team is our studio assistant Stevie. Stevie is at the front desk to welcome customers and help them with any enquiries they may have as well as taking appointments and ensuring the studio runs smoothly. Stevie also tends to the tattoo artists making sure they have everything they require to do each tattoo throughout the day.